One of the more popular choices for landscaping in Hampton Cove would be incorporating a water feature. There are plenty of choices available for adding a water feature to your yard and working with a reputable expert is part of understanding the choices and making sure it is done correctly. Even if you never thought it would be possible for the size of your yard, or budget, you would be surprised at the number of options there are available. Think outside the box, imagine the serenity and beauty a water feature could add and then find a professional to work with to make your dreams a reality. Not only does stacked stone look as stunning as it does natural but it can also serve as an art piece. Not to mention, depending on size and placement, this can also help to provide you with an extra level of privacy. This is one of those features that can work well in even tricky landscape situations like small yards or slanted grades. Perfect for enjoying from the patio or as background noise during a cookout. Opt for a remote control in order to make yours more energy efficient. Your landscape lighting can now extend to be included in a variety of designs, including walls and waterfalls. Lighting serves to change the look during the night making it look amazing but also serving as a measure of security lighting. 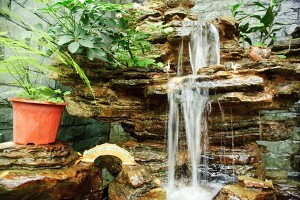 Some homeowners choose this as a secondary feature or as a way to include water in small spaces. This is ideal for your deck or patio or even for outdoor seating, especially if you have an outdoor kitchen and like to host gettogethers. Another fun option is to include a water feature in or near the pool. You may have a waterfall cascading into the pool or use something near the pool to become the focal point instead. 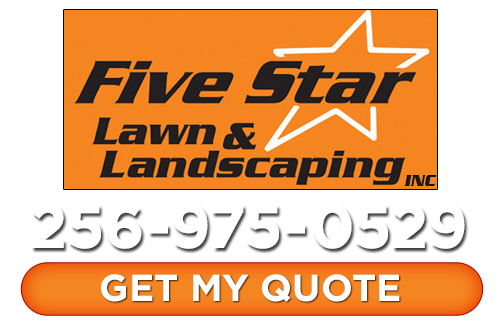 By working with the professional landscaping experts at Five Star Lawn and Landscaping, Inc. team to take care of your job for you, you can rest assured you are getting the finest in quality workmanship and customer care. We can help discuss with you different options you have so that you make a choice that will fit your style, yard size and budget. If you are ready to find out more about the choices you have for a water feature for your Hampton Cove landscaping project, trust in us to provide you with what you have always wanted. If you are looking for a Hampton Cove Landscaper then please call Five Star Lawn and Landscaping, Inc. at 256-975-0529 or complete our online request form.